Donald Bruce Dingwell is regarded as one of the leading volcanologists worldwide. He has become internationally renowned for the experimental investigation of physical properties of volcanic systems, in particular his research on silicate melts and glasses. 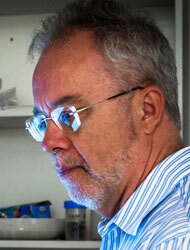 In the past years he focused on the kinetic processes of volcanic systems and eruptions. Dingwell will – as a GRC fellow in cooperation with the Institute of Geosciences – investigate the release of halogens during and after volcanic eruptions. His outstanding work earned him several honors, in recent years for example the honorary doctorate of the University of Alberta and the University College London as well as the Federal Cross of Merit. Furthermore, he is very engaged in the scientific community: He was secretary general of the European Research Council and is currently president of the International Association of Volcanology and Chemistry of the Earth's Interior (IAVCEI).